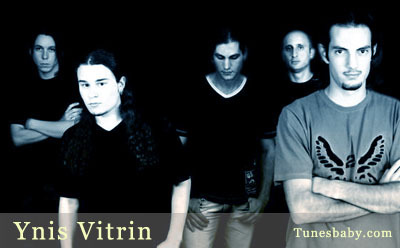 Ynis Vitrin (Caxias do Sul - RS) was created in 1999 with the proposite of playing cover songs of some rock bands. During this year, the band proceded rehearsing without a definitive name, as well as without any ambition that could makes it different of the other bands in the scene. In the half of 1999 the name Angel’s Garden came up, and the band started to work on it’s own songs, influenced by the 80’s Hard Rock. In the early 00’s, the former guitarrist, Fábio, and bassist, Leandro, left the group, that, at this time, was starting to compose heavyer songs. On 2000, two new members, Benhur Vieira Lima (bass) and Jocemar Maciel (guitars), joined the team, that has remained the same untill today. Now, as a heavy metal band, and under the name Episode, the first demo-CD was recorded, with only two songs: Regret and Crossfire (this one was re-recorded later and appears in the 2005 demo-CD, A Dark Land). This material was never released because of it’s weak result. After that, Benhur assumed the vocals, that were before in charge of the keyboardist Antônio. On March, 2003, the band entered the studio for recording a new demo-CD, called A Dark Land. Besides that the band changed its name again, now to the current and definitive: Ynis Vitrin. Because of some budget restrictions, the recordings extended untill March, 2005, when it was finaly released. Ynis Vitrin is trademarked by a heavy style, influenced by bands like: Blind Guardian, Dream Theater, Symphony X, Iron Maiden, Rush, among others. The demo-cd “A Dark Land” is composed by 11 tracks, including the powerful intro “The First Breath of Evil”. The melodic song “A Dark Land”, that shows exactly the will of the band for doing a great and unique work, with strength and _expression. A Dark Land is a piece, produced with sensibility, for those who like heaviness and innovation.